Ottomans are versatile pieces of furniture you can rest your feet on, turn into a coffee or side table, play games on and more. In addition to being very versatile, ottomans are also fairly simple to build. Make this easy high-density foam-topped ottoman in your choice of color and fabric to complement a wide variety of different decors. This finished ottoman measures 12-inches tall, 18-inches wide and 30-inches long. It makes a nice coffee table when not in use as a seat. Measure in 2-inches from each of the four corners of the sheet of plywood and place a mark. Drill starter holes the size of the bun foot hardware at each mark. Tap each of the blind-mounting nuts that comes with the bun foot hardware into the holes with a hammer. Screw the other side of the bun foot hardware into the tops of each of the bun feet. Screw the feet to the bottom of the plywood sheet. 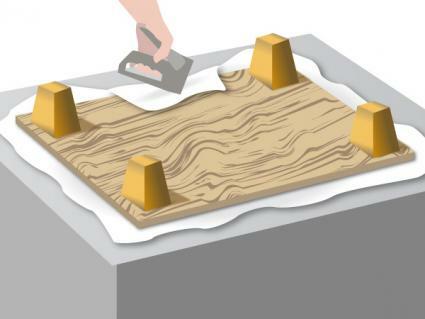 Place the foam batting on a flat surface and place the high-density foam in the center. Flip the plywood upside down on top of the foam. Grab one long side of the batting and pull the center of it up and onto the plywood. Staple into place. Grab the second long side of the batting, pull it onto the plywood and staple. Staple the two short sides of the batting onto the plywood, pulling it tight as you go. Gather up the batting on the first corner, pull it taut and fold it over so it lays flat against the plywood. Staple into place. Repeat for the other three corners. Place the muslin down on a flat surface. Set the ottoman, foam side down in the center of the muslin. Pull the muslin up on all four sides and staple to the plywood using the same method you used on the batting. Cut the slipcover fabric to 37 by 49-inches in size. Place the slipcover fabric print side down on top of the ottoman so it hangs evenly off all four sides. Pinch the fabric together at each corner so the slipcover wraps the ottoman tightly and you have a large flap of fabric hanging off each corner. Pin the fabric in place, 1-inch from the ottoman and cut off each flap of fabric. 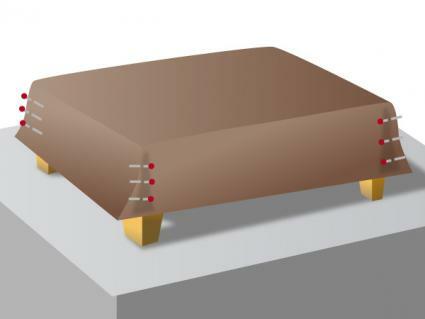 Remove the slipcover from the ottoman and use a fabric marker to mark the positions of the straight pins. Remove the pins. Fold up the bottom edge of the fabric 1/2-inch and press with an iron. Fold up the hem another 1-inch and press a second time to make a hem. Stitch the hem around all four sides. Turn the fabric print side in and replace the straight pins where marked. Stitch the four corners of the slipcover straight down. Turn the slipcover right side out and pull it down over the ottoman. The slipcover on this simple ottoman is removable and replaceable; make several in a variety of fabrics to update the look any time you choose. 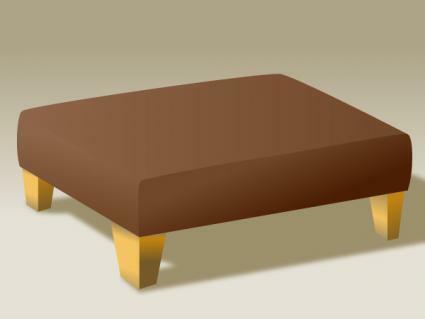 Make this simple ottoman as an addition to any room of your home and see what use you can put it to.